The screen on your Surface is larger than an iPad, but it’s probably smaller than your desktop PC’s monitor. That doesn’t mean you’re stuck with your Surface’s small screen, though. Your Surface includes a high-definition video port that lets you plug in desktop monitors, HDTV sets, and video digital projectors. Plugging in a monitor not only gives you a larger screen, it gives you two screens: Your Surface’s screen stays active, as well, if you want. In theory, connecting your Surface to a monitor is quite simple: Connect a cable between your Surface’s video port and your monitor’s input port. The challenge is finding the right cable. No single cable works in every situation. That’s because Surface tablets and monitors contain different types of video connectors. And your cable needs the correct connector on each end, or it won’t fit. The Surface RT and Surface 2 contain a micro-HDMI port. The Surface Pro and Surface Pro 2 contain a Mini DisplayPort port. 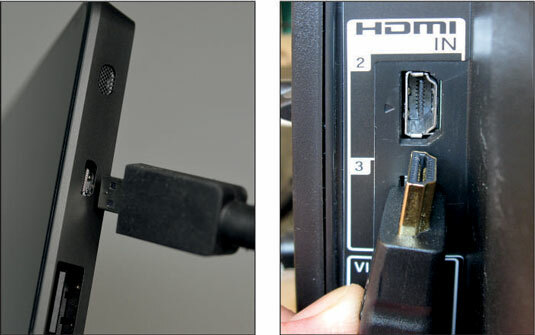 HDMI: This port is the same as the ones found on many computers, but it’s full-size — more than twice as large. HDMI cables also carry the sound as well as the video, a perk when watching movies on a big screen. DVI: The next most popular, this connector appears mostly on PC monitors rather than TVs. VGA: This oldster has graced the backs of monitors for more than 20 years, so it still exists as a last-resort connector. Cables and adapters with VGA connectors often cost more because they need more circuitry to translate between the types of signals flowing through the cable. Buy Microsoft’s customized adapters. At $40 apiece, Microsoft’s stylish adapters contain the correct jack for your Surface on one end, and a VGA or HDMI port on the other. Buy the adapter you need and then plug in your own standard VGA or HDMI cable. Buy a cable with the correct plug for your Surface on one end and the correct plug for your monitor on the other end. This might be your least expensive option for HDMI connections. If you already have a cable that fits into the video port on either your Surface or your monitor, head to Amazon, Newegg, or your local electronics store to buy an adapter for the cable’s other end. For example, an adapter can turn a standard HDMI plug into a micro-HDMI plug that fits into a Surface RT or Surface 2. Depending on the variety of external monitors you plan to connect to your Surface, you may need to collect several types of cables or adapters. The Surface’s sloped edges pose a challenge for many flat-faced adapters, especially those bought from third parties. If your adapter doesn’t reach far enough into your Surface’s video port, look closely at where the cable meets the Surface’s sloped case. You may be able to shave away some of the cable’s plastic end with a pocket knife, allowing the cable’s end to reach more deeply into the Surface’s port. When shopping for HDMI cables, be aware that the higher-priced ones don’t make the video signal any better. The cables either work, or they just lie there like soggy noodles. After you’ve connected the correct cable between your Surface and the monitor and told the Surface to send its signal to the monitor, you face one last challenge: You must convince the monitor to recognize your newly plugged-in Surface. Some monitors recognize your Surface’s connection immediately, filling their screens with the colorful Surface tiles. Others require more coaxing. The solution here works a little differently depending on whether you’re connecting your Surface to a HDTV or a PC monitor. Make sure your Surface is turned on and set to Duplicate mode, so your Surface sends a constant video signal to your monitor. When you see the Surface’s screen on the monitor, you’ll know you’ve found the right combination. HDTV: On your TV’s front panel or handheld remote control, look for a button for switching between video inputs. Keep slowly pressing the remote’s Video Input button, switching between inputs if necessary, until your Surface’s screen eventually appears. It might take a little fiddling, but you eventually see your Surface appear on the big screen.